A Presidente in GTA IV. The Albany Presidente is a four-door luxury sports sedan found in Grand Theft Auto IV. The Presidente is largely based on a first generation Cadillac CTS, with the back resembling the second generation CTS, and the headlights are reminiscent of the 2006-2008 Dodge Ram (they also resemble the headlights of the second generation CTS, albeit widened). 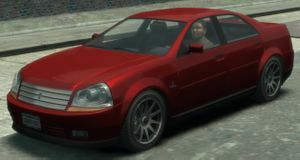 After collecting all thirty cars for Stevie, he agrees to purchase cars from Niko Bellic, with the Presidente fetching $2,500. The base model is depicted with a 4.5l V10 engine. The Presidente's engine is coupled to a 6 speed gearbox in RWD configuration. Acceleration is fair, but, due to its weight, the Presidente has an unexciting top speed of 96 mph (155 km/h). Handling is fair, but suffers from mild under-steer due to the up-front weight of the V10 engine. The suspension is somewhat soft, being able to absorb all the bumps on the road, but it does provide heaps of body roll. Braking is above average, and ABS is standard across the line-up. Crash deformation is surprisingly poor for this vehicle, and after one to two crashes it is known to pull to one side. The engine is somewhat sturdy and can survive a few impacts before failing. The Supercharge variant driven by the Korean Mob. "SPORT" Supercharged V-10 variants of the Presidente are driven by the Korean Mob. Based on the Cadillac CTS-V, the variant has a different front grille with a "supercharged" badge, black rims, dark blue metallic paint, and a rear spoiler. In a Drug Wars in The ballad of Gay Tony, a "SPORT" Presidente with a similar pearlescent blue body and black rims as the Police Stinger can be found. It can often be seen near City Hall, Algonquin. In Grand Theft Auto IV, the default radio station in the Presidente is The Vibe 98.8. Presidente is Spanish and Portuguese for President. This page was last modified on 24 August 2013, at 17:46.